In this OpenDataBC series of posts, I describe how to use some of the data that is being made available by the government of British Columbia on http://data.gov.bc.ca and related web sites. In the first article of this series, I described how to write a script to scrape catalog data from web pages. 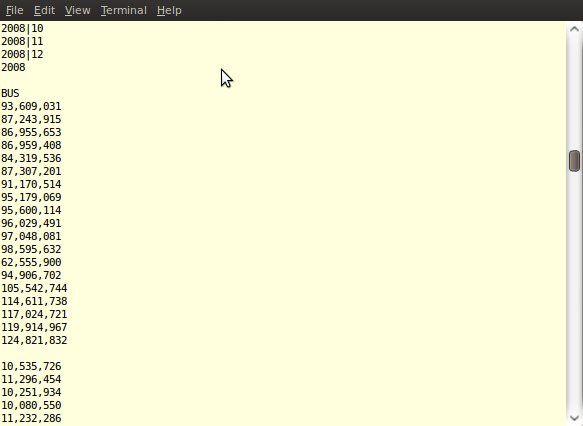 In the second article I described how to write a program to transform the data. In this article, I describe how to convert a PDF document into useable data. As part of the Apps for Climate Action Contest, the Province of BC released over 500 datasets in the Climate Action Data Catalogue. It's an impressive amount of data pulled from an array of sources both within BC and elsewhere. In an ideal “open data” world, all of that data would be in an easily machine readable format that we could use to write programs directly. While that would be great, the reality today is a bit different. Much of the data that is made publicly available these days is in formats that are harder to use. For example, some of the data in the Climate Change Data Catalogue was released in PDF format. PDF is a proprietary format, meaning the format is controlled exclusively by one party, in this case the Adobe corporation. An interesting fact is that it takes extra effort to get data from its raw form into PDF format. In other words, to publish data in an open format rather than in PDF format actually saves time, effort and money – up front. However, PDF became well established in the pre-open world, so a lot of data is already published using it. To switch existing software to publish in an open format might take time. As a result, at least temporarily, we need to find ways to get at the data in the PDF files. 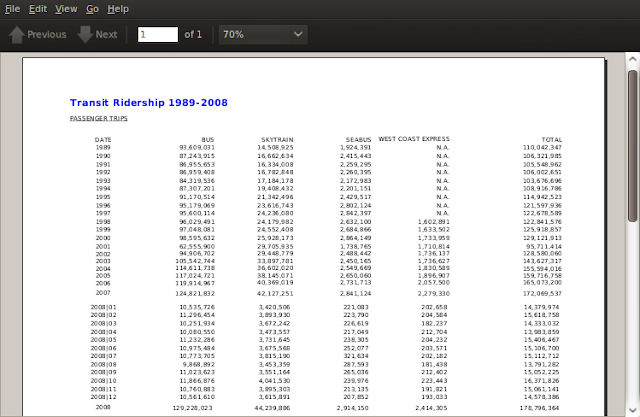 What I am interested in is the number of passenger trips by year for the past few years. 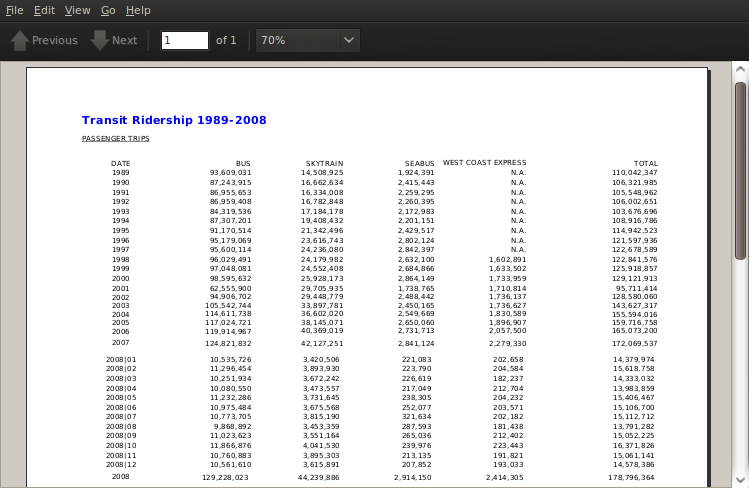 I am going to leave out the Seabus and the West Coast Express as I am mostly interested in the buses and the Skytrain. The pdf_to_text function starts by importing the components required to do the conversion. The pdfminer library provides a lot of functionality. In this example we are using a small fraction of its functionality to do what we need, which is to get at the content in the PDF. The main function that actually does the work is called process_pdf. It takes a PDFResourceManager object, a TextConverter object and a file object as parameters so the code before that call is setting up those parameters properly. I use a StringIO object rather than just passing the urllib2 object in because the PDF converter needs to use the seek method for random access which is not supported in urllib2. To gain this ability I put the data into a StringIO object, which supports seek. Now that we have the data in text format, we want to pull out the numbers that we are interested in. I am interested in the labels on the left, which start on line 6, the first numeric column (BUS), which starts on line 75 and the second numeric column (SKYTRAIN), which starts on line 144. 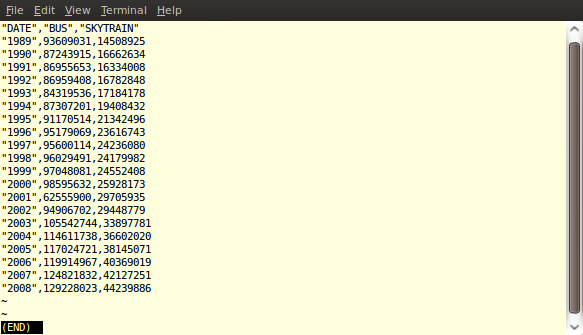 I wanted the resulting CSV file to have numbers rather than strings containing numbers for the numeric values. The last line of this function strips out the commas that were in the numbers in the PDF file and then converts the text to a long integer to be written the CSV file. This result is a lot easier to deal with than the original PDF file. Arguably, a small file such as this could also be converted with Open Office Spreadsheet by cutting from the PDF and pasting to the spreadsheet. The nice thing about doing this as a script as above is that we can use this same technique for very large PDF files that would be too onerous to do manually. Once again, Python comes through for us. Clearly it's not as easy to convert a PDF file as it is to rip a table out of an HTML file, but being possible at all makes it something we can work with. And part of the beauty of “Open” is that now that I have done it, others don't have to. And I in turn will benefit from other contributors to the open ecosystem. If we all do a bit, it's an “everyone wins” scenario. how to detect images whether images are present in pdf or not?